MultiLINX automatically adjusts to operating voltages from 2.5 to 5 volts. This system is new in the original box. 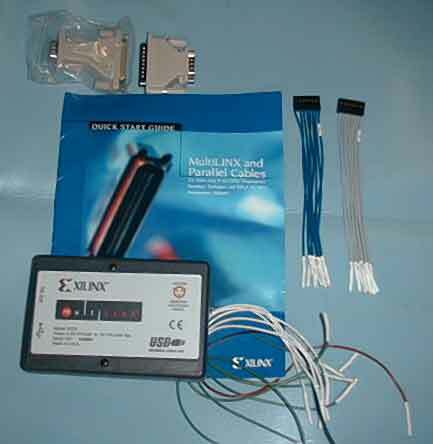 The MultiLINX download cable pod may be connected to either the RS232 serial cable or the USB cable. Only one cable should be used at a time. However, if both cables are connected the RS232 serial cable will override the USB connection. The RS232 cable may be connected directly to the 9-pin port of a PC. The 25-pin adapter allows for connections to the 25-pin serial COM port of a PC or a UNIX workstation. The USB cable is keyed for a "Host" connection at one end (rectangular) and a "function" connection at the other end (square). The square end connects to the MultiLINX cable pod. Do not use with an external USB HUB. 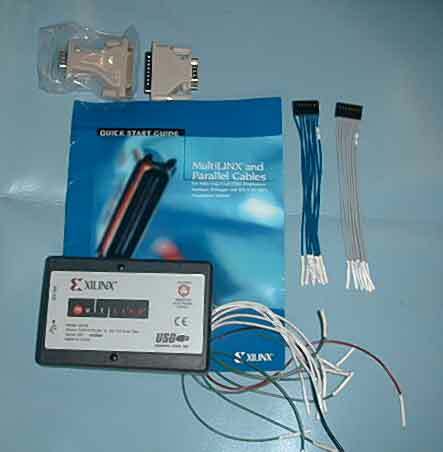 The MultiLINX cable has four sets of flying-lead connectors that are used to connect your target system. The lead ends fit standard 0.025in2 header pins. The PWR and GND leads may either be connected to the target system or a separate power supply. However, GND should always be common between the target system and the MultiLINX cable for proper I/O communication. The MultiLINX cable requires a 2.5-5V input on the PWR lead and requires approximately 500mA nominally at 3.3v. Buyer will pay $10.00 packing and shipping in the continental United States. We will make every effort to ship within 24 hours of receipt of payment. We ship with FedEx & UPS only. We will be glad to ship with other carriers using the purchasers shipping account. Please contact us to make any special shipping arrangements. For shipping rate research, our shipping address is Boulder, CO USA ---- Zip Code is 80305. Ascent Concepts and Technologies is a Research & Development Lab. As a service to the companies and institutions we work with, we broker their excess equipment & act as application specialists on their new equipment needs. We are now offering quality used equipment to the public with the same level of professionalism and service. Please feel free to email at thomasknox@ascentconcepts.com or call Thomas @ 1-303-554-0307 with any Technical questions. Please feel free to email at waltwhite@ascentconcepts.com or call Walt @ 1-720-276-8288 with any Shipping or Logistical questions. We make every effort to evaluate and guarantee our equipment. Although we do not provide NIST traceable calibration, we do have extensive in house calibration equipment and make every effort to test and verify performance on equipment we sell. However we do not warranty any items shipped outside the United States.